One of the most desirable districts for property purchase in Palma city, Casco Antiguo – or ‘Old Town’ in English – is the historical centre of the city. Here, the beautiful architecture meets excellent shopping, great restaurants, art galleries, museums and amazing landmark buildings, such as the picturesque cathedral. Living in Palma Old Town property, it is very easy to get inspired by the charm of this pearl of the Mediterranean. Many properties in the Old Town of Palma benefit from their unique location. From the roof terraces, you can have spectacular views over the historic quarter, the Cathedral and the sea. Moreover, in spite of being in the middle of all the activities, the area provides its residents unusual tranquility. Prices on Palma Old Town property market are higher compared to Mallorca in general. The average price ranges from Average price per sqm. in Catedral - Casco Antiguo €5,057 -1% properties#: 434 last change on: 19 Apr 2019 €5,057 per square meter for an apartment to Average price per sqm. in Catedral - Casco Antiguo €4,954 0% properties#: 42 last change on: 19 Apr 2019 €4,954 per square meter for a house. Investment is possible for around Average price per sqm. in Catedral - Casco Antiguo €4,476 0% properties#: 72 last change on: 19 Apr 2019 €4,476 per square meter. There is a premium value for properties providing a view of the sea. In Calatrava, the historic district of Palma de Mallorca, located around the Cathedral La Seu, most of the properties date between the twelfth and nineteenth centuries. Numerous homes have been already converted into design boutique hotels or reconstructed and divided into several deluxe apartments. There are still some ancient palaces and townhouses for sale that need to be renovated offering an excellent investment opportunity with a great potential. The most notable real estate agencies on Palma Old Town property market with the highest number of listings are Engel & Völkers with more than ninety offers, Balearic Properties, Kensington International and Vogue, all with more than 60 listings in the area. Why Palma Old Town property? The Old Town area is characterised by such elements as narrow winding streets and Mallorcan courtyards, as well as bourgeois palaces, churches and other medieval buildings, reminiscent of Palma’s past. La Seu Cathedral (the local name for Palma Cathedral) is one of the most famous Gothic buildings in Europe. This impressive Roman-Catholic temple was built under the reign of King James I on the walls that encased Palma’s Old Town. It has 44 metre-tall nave, which is also the second largest in the world. The Palace of Almudaina stands facing the Cathedral, with which it forms the heart of Palma’s Old Town. This outstanding stately stone palace represents a mix of Moorish and Gothic styles. Since its remote origins, it was transformed by King James I into a palatial residence. Today, it houses official events involving visiting members of the Spanish royal family. Behind the Cathedral, you can explore the narrow cobbled streets of the Old Town or have a glass of wine or a coffee at one of the small plazas. The places worth visiting along the way are the peaceful Bishop’s Garden and the Banys Arabs (‘Arab Baths’ in English). The historic square of La Lonja, on the other side of the Paseo del Borne, is the most vibrant and popular area. Undeniably, one of the highlights of this square is an exceptional Mediterranean-Gothic building of the former stock exchange. Exhibitions and celebrations are often held in this beautiful building with magnificent interiors. Apart from the unique architecture, La Lonja has the unlimited choice of gastronomic establishments to suit everyone’s taste. It is full of numerous cafes, tapas bars and stylish restaurants, where you can have a memorable Mediterranean dining experience. Especially notable is also the unique cocktail bar Abaco. Housed in a sixteenth-century palacio, with fruit and flower displays, and classical music, it is one of the most creative bars in Mallorca. 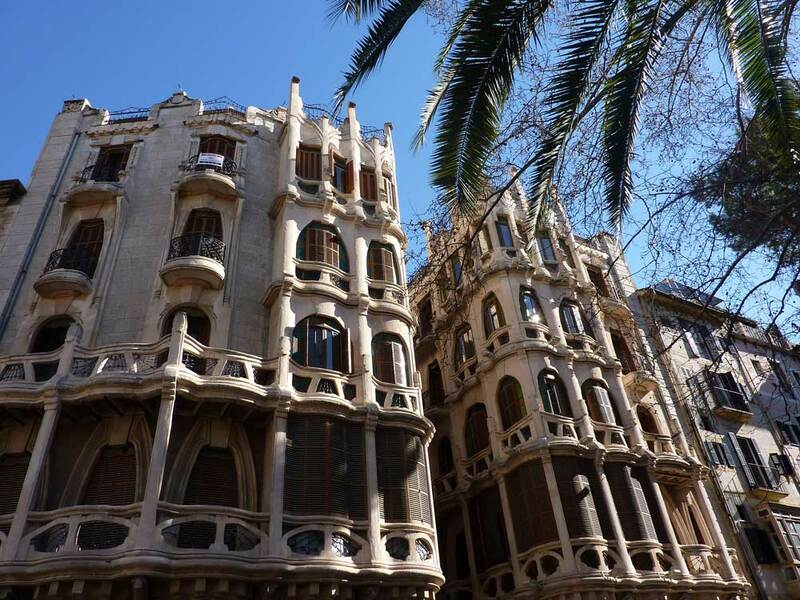 Avinguda Jaume III is one of the best-known and elegant streets in Palma city. The avenue is lined with sophisticated shops boasting men’s and women’s fashion as well as jewellery and gifts. Leading off Jaime III, a beautiful palm tree lined boulevard of Paseo del Borne offers a nice walkway coupled with great designer boutiques and luxury shops. The most exclusive and expensive Spanish and international brands have settled en mass over the last few years here. For example, here you can find such brands as such as Louis Vuitton, Hugo Boss, Carolina Herrera, Mulberry, and Palma’s own up-market jeweller Relojeria Alemana, among others. La Lonja is also the hotspot for a fantastic nightlife, attracting visitors and locals alike. From sundown well into the night, it is offering a great selection of clubs and sophisticated places within walking distances from each other. At such hotspots, as the Jazz Voyageur Club, you can enjoy live performances of jazz, swing and blues that come alive with the illumination of the gothic architectural buildings as a background setting of the Old Town. Though many of the properties have been renovated and turned into luxury apartments, fitted with all the modern amenities, this antique part of the city of Palma still has its original charm and style. The old town’s apartments are the most sought-after properties in Palma region. And, the area is becoming more and more popular with foreign prime second home buyers. Especially, it is attractive to those high-worth-net individuals, who want to be at a walking distance from the heart of the city with its beautiful shopping streets and nice restaurants and live in an perfectly quiet location with the historic and sophisticated atmosphere.